The rain of the past three days let up this afternoon, and Bunty and I took a stroll up the lane. The woods are fully in leaf now, and the chestnut trees are scattering the confetti of their blossoms across the tarmac, lacing the air with their honey-like scent. Blossoms are not all they are scattering. 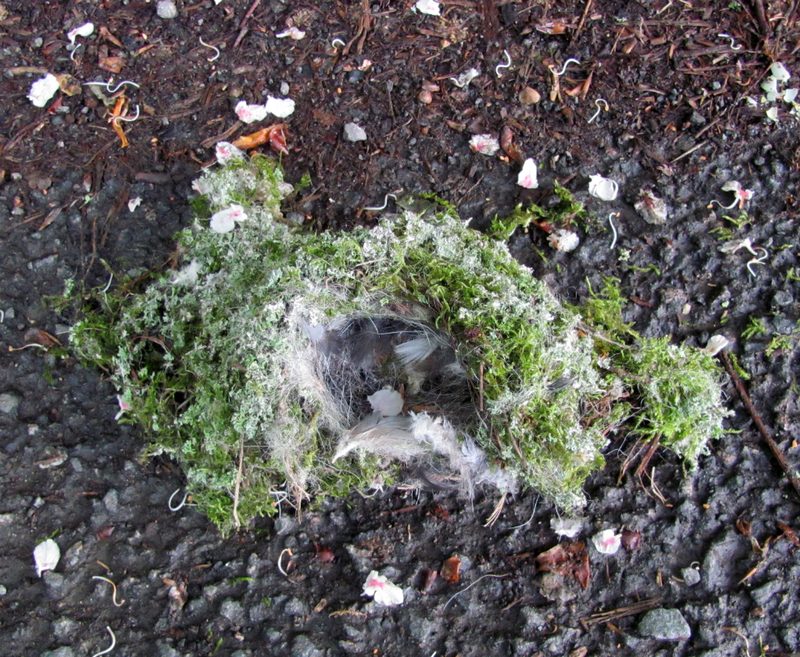 I found this blackbird nest lying at the side of the road, soaked in rainwater. I picked it up, thinking our artist neighbour might like it. She collects items from nature for sketching and painting. “Do you want the egg as well?” asked Bunty, pointing out a turquoise speckled object nearby. I picked it up, wondering if it could be kept alive by incubation. But it was badly cracked. I took them both to the artist’s house, but she was out, so I sat by the wildlife pond for a little while. I contemplated the egg in my hand. It was cold. It didn’t seem to be seeping any fluid, however. 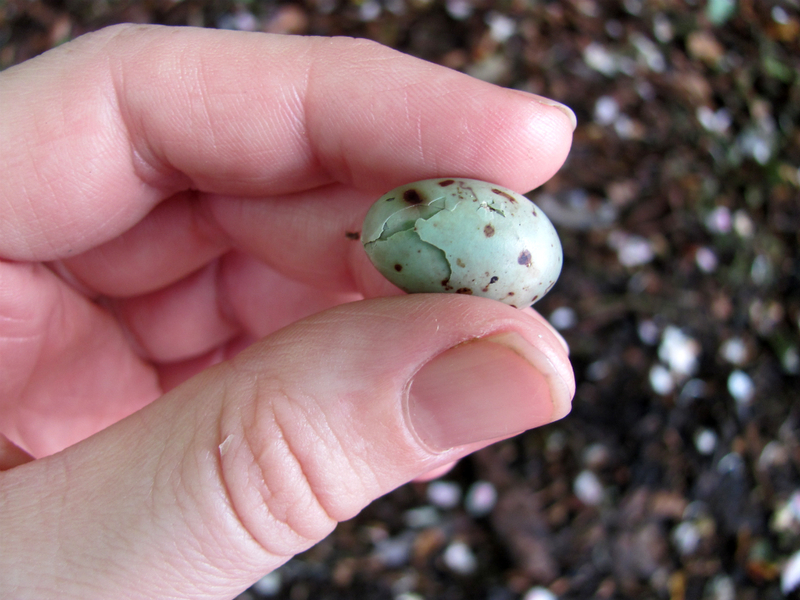 I flipped up the jagged piece of shell at the tip, and saw a fully-formed beak beneath. Was the bird alive or dead? I didn’t know. I tucked it into my cleavage, as that seemed the safest warm place to keep it until I figured out what to do next, and I returned to the cottage. In need of advice, I began this blog entry. I pondered the possibility of knocking up an incubator. I have fireglow bulbs, a clip-on lamp, a reptile heat pad, a microwavable heat pad for pets, thermometers, and a collection of vivariums with lids. Remembering that blackbirds have regional accents, and ones bred in isolation have pathetic songs, it occurred to me that, if it hatched, I would have to teach it to talk. I can imitate the basic warbles of a blackbird pretty well, so I felt I could at least cover its primary education. After that, I’d have to take it outside regularly to listen to the local blackbirds. I didn’t want my blackbird to be a social outcast. I checked my cleavage to make sure the egg was still in position. It wasn’t. I rummaged around in my bra trying to find it, and couldn’t. My bosom is so big that I actually lost an egg in it. I had to peel off all my clothes, very carefully, to find it again. I wear a lot of layers, and it took some time. The egg finally revealed itself after I turned my innermost top inside out over the bed. It rolled out, looking as conspicuous as hell and like there was no way I could possibly have lost it. It not only looked conspicuous; now that it was nice and warm, it smelled conspicuous. My question as to whether it was dead or alive was answered. My heat pads can stay in storage for another day, and I need a shower. 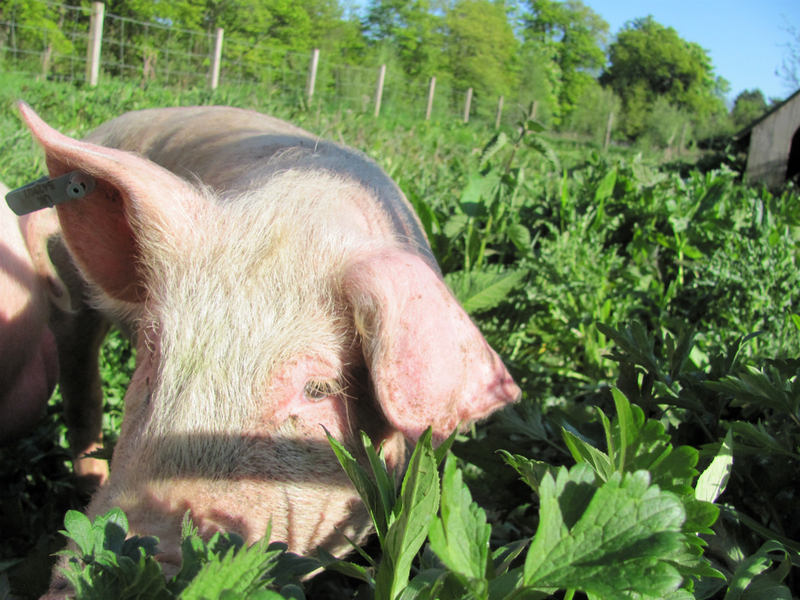 I had gone up the lane to photograph some of the lambs that have been gambolling in the fields since the beginning of April, but who can resist a pig-pig-piggy? I hurried to the gap in the hedge, and stepped through to find the two brothers from the manor house leaning on a gate admiring their latest arrivals. Two young large whites trotted through the undergrowth toward us. I was informed they were four months old: born on January 17th. Don’t they have a nice meadow? “An afternoon?” suggested the Pig Man. They ran through some possible names to call them. Pinky and Pinky seemed good contenders. 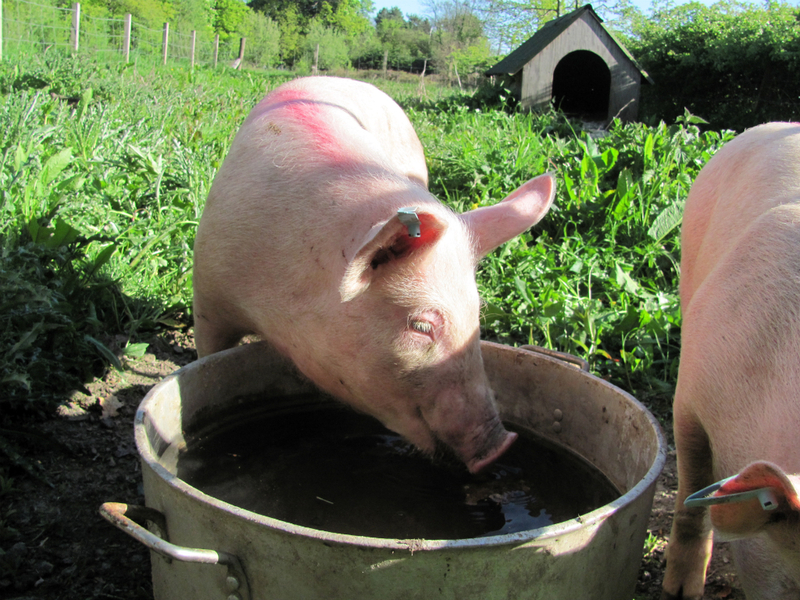 The sow’s charming floppy ear is the result of a haematoma, poor thing. Perhaps another pig bit her. It’s very swollen, and she seems to appreciate having it held between cool hands. The pig Man turned to me. “Would you like some freshly-laid eggs?” he enquired. “We’re selling ’em for a pound for six, but I’ll give you a freebie”. “I’d love some,” I said. 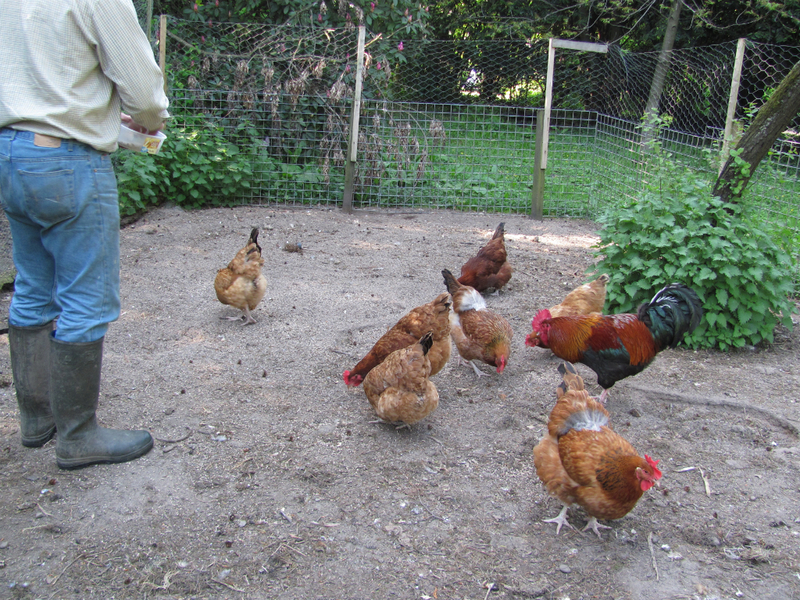 He led me though a patch of woods and garden to the shed where he kept his chicken feed. He pointed out a robin’s nest in the corner, and said it has little blue eggs in it and he has to be careful going in and out. I really wanted to photograph it, but it was too dark to tell whether the robin was in it; she would have been distressed by my flash. The Pig Man took me to his chicken run and scattered feed, then showed me into the hen house, where a cluster of six eggs lay in a nesting box as though the hens had thoughtfully gathered them together for me. He gave the eggs to me in his feed scoop, asking me to return it later. In the garden, his wife was planting beetroots and carrots, and I had a little chat with her about the merits of growing different vegetables. The sheer friendliness of these people made my day. What a contrast to that angry farmer last month! It made me realise how unwelcome I had been feeling here lately. Thank you, dear neighbours, for restoring my faith in people. 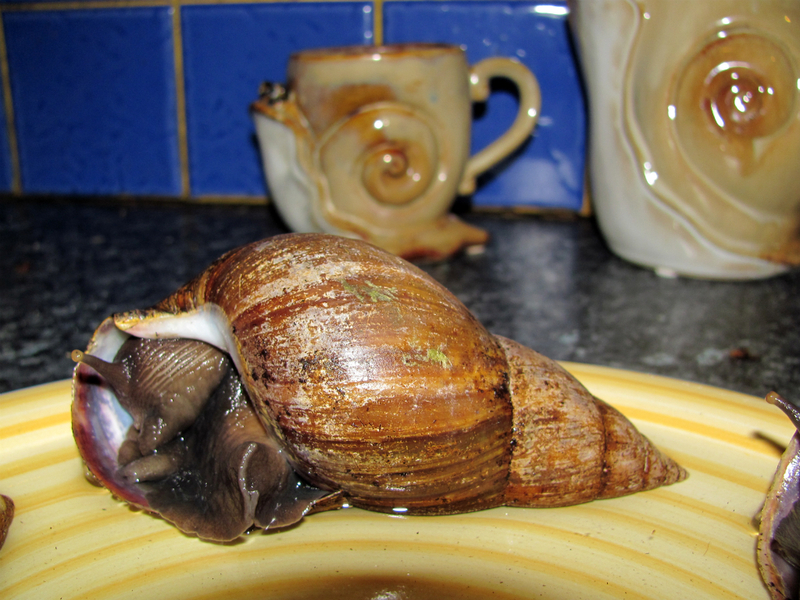 It’s easy to neglect giant African landsnails. Unlike our other pets, they don’t whinge and jump around when they want something: they are the epitomy of decorum. If conditions aren’t to their taste, they withdraw into their shells, seal up the entrances, and remain in a state of suspended animation until things improve. What with one thing and another, I haven’t fed them for about a month, and they have been patiently waiting to be woken up for breakfast. I do this by soaking them in a dish. Contact with the lukewarm water gradually wakes them up, and they emerge and wallow and drink until they’ve had enough, then ooze their way toward dry land. I made a sandwich while they were waking up, and wandered off to eat it and browse the web. When I returned, they were more than ready to get out of their bath, and Hieronymus had found my margarine tub. I’m glad I’d remembered to put the lid on. 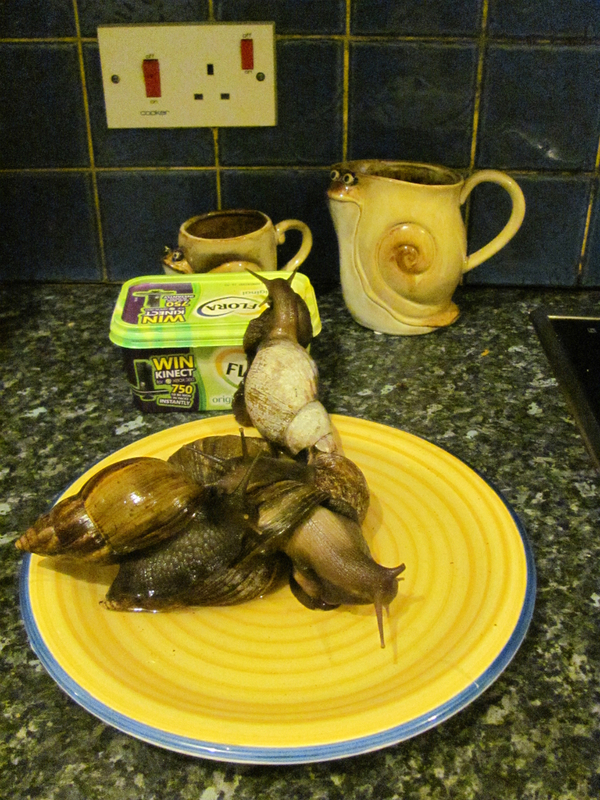 I expect anyone who’s had dinner at our place will never want to do so again! If it’s any consolation, I did sterilize the plate afterwards.